My favorite holiday, Fall, has not been kind to me so far. It officially started at 5:04 am. It was supposed to be great. 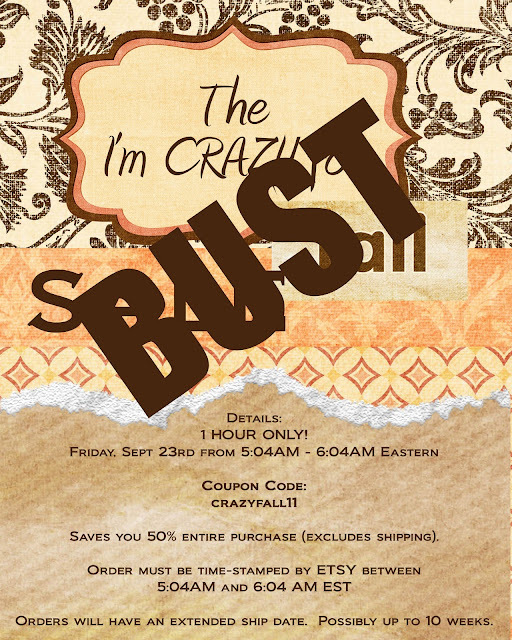 About my amazing, awesome, gigantic 50% ONE HOUR sale. Well, it was pretty crucial that the INTERNET be working for that small window of time. I never thought my trusty business partner (the World Wide Web) would decide to SLEEP IN this morning. I woke up to a frantic phone call from a friend who was trying to order. The coupon code wasn't working. I turned on my computer to find that awful exclamation point over my internet connection symbol. I couldn't fix the code. And I couldn't very well run the entire sale from my iPhone (as smart as it is). My heart dropped as I envisioned all you sleepy mamas who woke up just to get a deal on a BLB. I'm so sorry, my friends. So, if you got up this morning hoping to take advantage of the SALE, and went back to bed because of issues on my end, email me with your order. I will uphold my end of the deal. I was thinking of you last night. I saw your sale but cannot spend the extra money at this point. I am waiting patiently to one day (hopefully soon) to be able to get you to make a diaper bag when my son and DIL decide to grace me with a sweetie pie. Anyway, back to the point, I think it was you that first mentioned pinterest. I think it was an invite because I could get on. I couldn't understand it. I couldn't buy anything and all I could do is look and I didn't even know how to do that and it didn't come with instructions. I left sad and would ignore your post about the challenges being all confused. Now I have instructions, 22 boards and when my husband is watching football, I am right beside him pinning away. Thank you for introducing me, I think!! No really, I love, love it!!! I would rather see your precious children pics any day because I am a sucker for poofy cheeks and big eyes and mine are all grown, and I love hearing how you and your husband are ministering to your community in such a HUGE way and living on Faith. It is exciting to hear what God is doing through your little family! Anyway, thank you for blogging, taking time, giving time, ministering, supporting, being Jesus' feet! You are an inspiration!